I have spent the last few weeks in Delhi. Its been a time of relaxation for me, hanging out with family and enjoying the company of friends who have dropped past. What I have enjoyed the most has been discovering some little gems in Delhi that I wouldn’t normally get to see if I was just traveling past for a few days. Its been a bit more like seeing Delhi as a local and has certainly made me think that maybe this could be a place I could settle, if only we could move the ocean a bit closer. So here are just a few of the things I enjoyed in Delhi. INA Market: No visit to any city is complete for me unless I have visited a local market where people buy their fruit, vegetables and groceries. I have visited a few in Delhi, but my favourite so far is the INA Market where we did our pre-Diwali shop. From the grocery store which is 2m x 1.5m in size with most of the groceries tucked away in the roof to the meat section. I don’t eat a lot of meat, so whilst I found walking past discarded hoofs a little confronting, I was absolutely fascinated by the knife skills at the local chicken shop. One man sat on the bench with his knees tucked near his chin, a large piece of chicken held with both hands positioned just under his raised foot and a huge sharp carving knife carefully positioned between his big and second toe, cleaning the chicken with absolute precision. India Gate at Night: My first attempt to see India Gate at night abruptly ended before it began. I arrived at 9.50pm only to find out that the lights on the monument were shut at 10pm. The next time I was better prepared, arriving around 8pm. 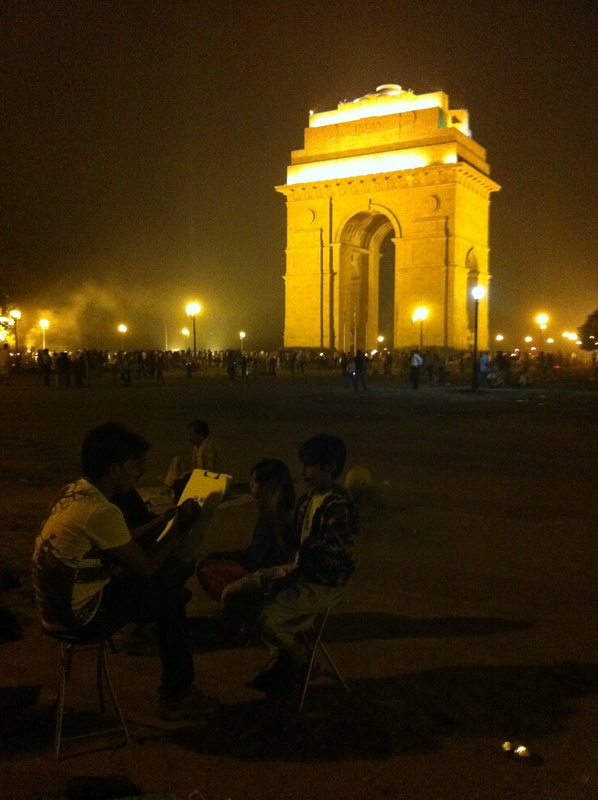 The best thing about visiting India Gate at night is the people watching. The grounds are covered with young couples and families wandering around, eating, having their portrait drawn and of course taking photos. National Gallery of Modern Art: As a huge fan of modern paintings I thought this art gallery was fantastic. Spread over 4 floors, with a few mezzanine floors, the gallery exhibited primarily paintings, but also sculptures and photographs by modern Indian artists. It is a great place to introduce yourself to modern Indian art, it certainly whet my appetite to go out and seek out other smaller exhibitions. Delhi is full of malls and shopping areas. Like most of India, every corner has someone selling something. I was staying near Khan Market, and can’t say it really endeared me as a shopping experience, but it certainly had a lot of western comforts. Nearby is the much smaller and quieter Meharchand Market which has some small but sensational shops with beautifully designed but unusual homewares and clothes. I just loved The Play Clan, which had some very funky Delhi designed clothes, crockery and art. Quite unexpectedly I stumbled upon the shopping district of Shahpur Jat, located very close to another great shopping haven Hauz Khas Village. Shahpur Jat has a few narrow roads crowded with apartments and small design studios with little shops attached. The shops are tiny, but jam-packed with some amazing and unique items, from hand block painted kurtas to some glorious fridge magnets depicting moustached rickshaw drivers. The stand-out by far was a small paper based designer Anand Prakash and his intricate and stunning metal book marks. Dilli Haat: This open air market showcases handicrafts and food from all over India. Whilst a bit of rummaging is required to find what you want, there are some bargains to be had here. It also makes it easy for those who don’t have the luxury of being able to travel across India and pick up local crafts from their original location. I just loved the beautiful hand painted silk manchester from Rajasthan which made a wonderful wedding gift. After only a few weeks, I have only started to scratch the surface of what Delhi has to offer, so please feel free to comment and add in any other gems that you know and love in Delhi. ← Varanasi: Is there any hope for India? Hey. I am from kerala but worked in Delhi for 5 years and fell in love with that city. If you like market places, you can try Lajpat Nagar(warning – really crowded on weekends).Try Nizamuddin Dargah – its a different experience alltogether. Chandni Chowk too is a must visit. Thanks for the recommendations, I will definitely put them on the list. I’ve been living in Delhi for almost 8 years and am loving every bit of it. Ofcourse there are times when I get super pissed with the city but overall, Delhi is simply amazing. Khan Market is a great place but am more of a bargain hunter, so i try my best to avoid that. BTW, have you ever been to Paharganj in Old Delhi. If not you should totally visit that place. There are so many cheap bars, cafes and restaurant. if you want to check out Paharganj, i can suggest you some great joints like ‘Sam’s Cafe’, and ‘My Bar’…. Thanks so much. I kept forgetting to take my camera when I was just out and about in Delhi, I really must get into the habit of taking it everywhere with me. Oooh I love a market too and can always go shopping, anywhere, anytime. Looks fabulous! Yes the Delhi winter has come on very quickly. I am now sleeping with a quilt over me and carrying a shawl at night. It is a refreshing change from the stifling heat.